Adjacent to Equarius Hotel, the Beach Villas are sprinkled across the resort’s 49 hectares of manicured tropical gardens. The villas are so spread out and secluded that guests are transported to the Villa doorstep by golf buggy. The 22 Beach Villas are available in lay-outs with one, two, three, or four bedrooms. Each bedroom is furnished with one king or twin-sized beds with duck-down duvets as well as its own LCD TV, iPod dock, and en-suite bathroom. The bathrooms are extremely luxurious with marble surfaces, separate rain shower and soaking tub, ESPA spa products, and an LCD TV mounted above the bathtub. All Villas have a fully-stocked mini-bar, premium TWG teas, and Nespresso maker, while the larger villas have a kitchenette and dining room. 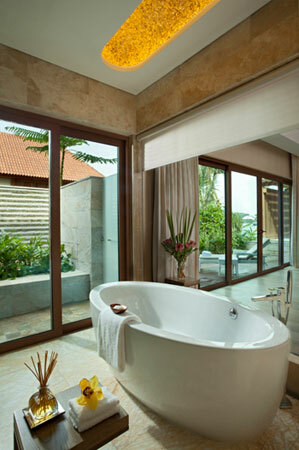 The Villas are enriched by modern art and accent pieces made from natural materials. Large windows and sliding glass doors allow the Villas to be opened up to take in the spectacular views of Keppel Bay and Labrador Park. There may not be a beach, but the One-Bedroom Villas have wooden sundecks that extend to a private plunge pool and offer direct access into the free-form swimming pool. 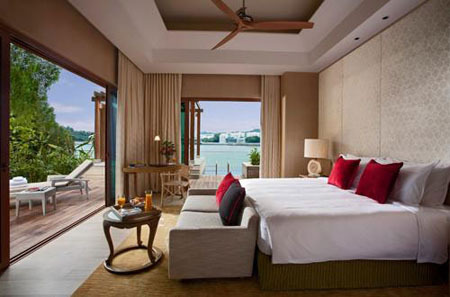 The larger Villas have private lap pools located right along the edge of the waterfront. 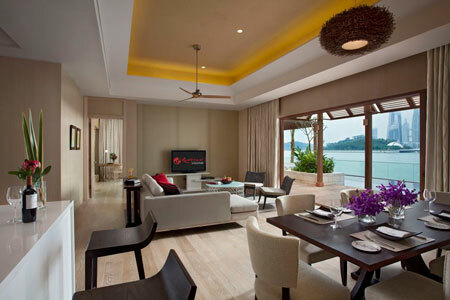 The crown jewel of the Beach Villas is the two-storey, four-bedroom Villa nicknamed “The Palace”. Measuring over 730 square meters, this Villa would be ideal for family reunions or special events. 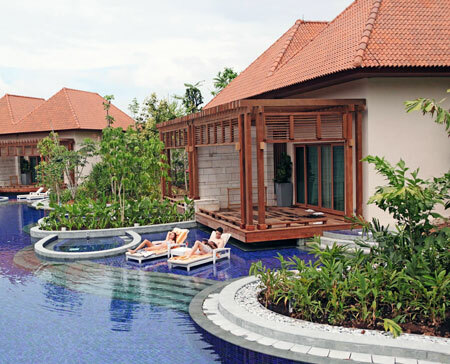 In addition to the amenities found in all Villas, it features a large living room, private spa treatment room, outdoor dining area, and barbeque. All guests at the Beach Villas enjoy 24-hour butler service and have access to the gymnasium at ESPA Spa.